Combining decades of experience with advanced measurement and analysis, the V-Type has been built using a carefully balanced 'recipe' of old and new design techniques. 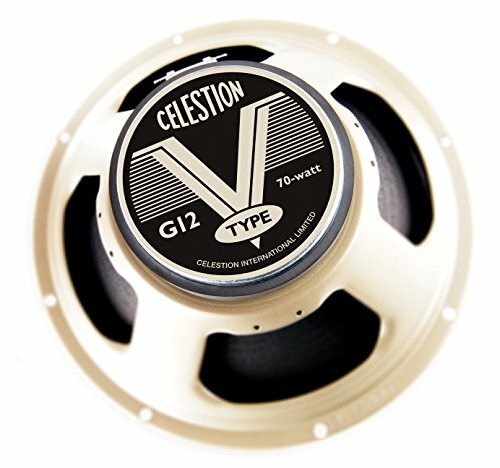 It produces a heady, exciting modern vintage sound that just makes you want to keep on playing: a speaker that delivers authentic Celestion tone whatever your style. The V-type is a sweet sounding speaker with a superbly balanced tonal signature that imparts a vintage musicality to your tone. Clean sounds are true across the lows, mids and highs, with just enough upper-mid chime and HF sparkle to add clarity and definition. Crank it up for a sizzling overdrive and raw rock tones, with plenty of mid-band warmth to give body and substance to lead note playing. SPECIFICATIONS Power rating: 50W Nominal impedance: 8 ohms Sensitivity: 98 dB Frequency range: 75-5000 Hz Unit weight: 7.2 lb. ; Shipping weight: 8.8 lb..